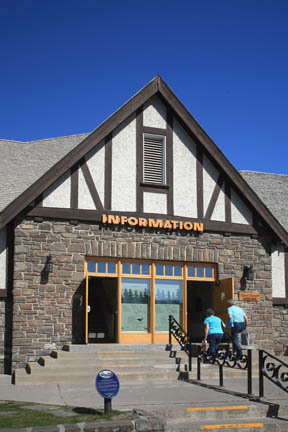 Many sources of information are available on the park and its commercial facilities. Once you’ve arrived, the best place to make your first stop is the Banff Visitor Centre (224 Banff Ave., 8 a.m. to 8 p.m. daily mid-June to Aug., 8 a.m. to 6 p.m. daily mid-May to mid-June and Sept., 9 a.m. to 5 p.m. daily the rest of the year). This central complex houses information desks for Parks Canada (403/762-1550) and Banff Lake Louise Tourism (403/762-0270), as well as a small bookstore, which stocks a good variety of park-related literature. On the right-hand side of the Banff Visitor Centre is a row of desks staffed by Parks Canada employees. They will answer all of your queries regarding Banff’s natural wonders and advise you of trail closures. Anyone planning an overnight backcountry trip should register here and obtain a camping pass ($10 per person per night). Also here, you can pick up park brochures, or wander down the back to peruse park maps, view a free slide show, and watch videos about the park. All questions pertaining to the national park itself can be answered here, or check out the Parks Canada website (www.pc.gc.ca). The park’s Warden’s Office (403/762-1470) is in the industrial park. The weather office (403/762-2088) offers updated forecasts. If you want to see the weather in Banff, check out the webcam at www.banffgondola.com. Tune in to FM 101.1 or go to www.friendsofbanff.com/park-radio for Park Radio, which features Banff-related programming. In the Banff Visitor Centre, across the floor from Parks Canada, is a desk for Banff Lake Louise Tourism. This organization represents businesses and commercial establishments in the park. Here you can find out about accommodations and restaurants, and have any other questions answered. To answer the most frequently asked question, the restrooms are downstairs. For general tourism information, contact the Banff Lake Louise Tourism office (403/762-8421, www.banfflakelouise.com). Look for the free Bow Valley Crag and Canyon each Wednesday. It’s been keeping residents and visitors informed about park issues and town gossip for more than a century. The Rocky Mountain Outlook is another free weekly newspaper that offers coverage of mountain life and upcoming events. Both are available on stands at businesses throughout town. The Canadian Rockies are one of the most written about, and definitely the most photographed, regions in Canada. As a walk along Banff Avenue will confirm, there is definitely no lack of postcards, calendars, and coffeetable books about the area. Ted (E.J.) Hart, a former director of the Whyte Museum, has authored over a dozen books on the history of the park. Summerthought Publishing (www.summerthought.com) is a local company that has been publishing the authoritative Canadian Rockies Trail Guide since 1971. Under Wild Bill’s, at the corner of Banff Avenue and Caribou Street, The Viewpoint (201 Banff Ave., 403/762-0405, 9 a.m. to 9 p.m. daily in summer, shorter hours the rest of the year) is the town’s lone independent bookstore. Small in size it nevertheless stocks just about every book in print about the park, as well as Canadian bestsellers, maps, and gifts such as photographic prints. The Whyte Museum Shop (111 Bear St., 403/762-2291, 10 a.m. to 5 p.m. daily) specializes in regional natural and human history books, and also has a good selection of historic prints. Banff’s library (opposite Central Park at 101 Bear St., 403/762-2661, 10 a.m. to 6 p.m. Mon. to Fri., 11 a.m. to 6 p.m. Sat., 1 to 4:30 p.m. Sun.) boasts an extensive collection of nonfiction books, many about the park and its environs, which makes it an excellent rainy-day hangout. It also has a large collection of magazines and newspapers. Internet access is free. The post office (9 a.m. to 5:30 p.m. Mon. to Fri.) is on the corner of Buffalo and Bear Streets opposite Central Park. The general-delivery service here is probably among the busiest in the country, with the thousands of seasonal workers in the area. Major banks can be found along Banff Avenue and are generally open 10 a.m. to 4 p.m. Mon. to Thurs. and 9 a.m. to 4:30 p.m. Friday. The Bank of Montreal (107 Banff Ave., 403/762-2275) allows cash advances with MasterCard, while the C.I.B.C. (98 Banff Ave., 403/762-3317) accepts Visa. Freya’s Currency Exchange is in the Clock Tower Mall (108 Banff Ave., 403/762-4652). The only downtown laundry is Cascade Coin Laundry (7:30 a.m. to 10 p.m. daily), on the lower level of Cascade Shops. Chalet Coin Laundry (8 a.m. to 10 p.m. daily) is on Tunnel Mountain Road at the Douglas Fir Resort, within walking distance of all Tunnel Mountain accommodations. Along Banff Avenue you’ll find Banff Camera Shop (101 Banff Ave., 403/762-3562), with digital imaging capabilities and a full range of equipment. Mineral Springs Hospital (301 Lynx St., 403/762-2222) has 24-hour emergency service. Rexall Drug Store, on the lower level of the Cascade Plaza (317 Banff Ave., 403/762-2245), is open until 9 p.m. daily. Send and receive email and surf the Internet wirelessly at all downtown cafes, or head to Banff Public Library (101 Bear St., 403/762-2661, 10 a.m. to 6 p.m. Mon. to Fri., 11 a.m. to 6 p.m. Sat., 1 to 4:30 p.m. Sun. ).